Peugeot - I Say Ding Dong Shop - Buy Stickers, Decals & Unique Automobilia. Motul 1950 - 60's Style Winged Text Sticker. 5.5". Motul 1950 - 60's Style Winged Text Stickers. 3" Pair. Peugeot 205 T16 1985 Monte Carlo Rally Winner Lick'n'Stick Window Sticker. 5" or 7". Peugeot 205 T16 1985 Monte Carlo Rally Winner Sticker. 7". Peugeot Black & Gold or Black & Silver Old Script Style Stickers. 5" Pair. Peugeot Black & Silver Oblong Sticker. 8". Peugeot Black & Silver Oblong Stickers. 5" Pair. Peugeot Blue on Silver Wheel Centre Style Stickers. Set of 4. 50mm. Peugeot Blue Text Oblong Stickers. 2.5" or 6" Pair. Peugeot Classic Lion in Shield Sticker. 6". 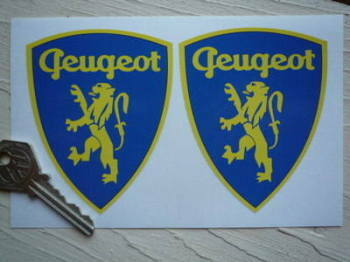 Peugeot Classic Lion in Shield Stickers. 3.5" Pair. Peugeot Classic Red & Black Lion in Shield Stickers. 3.5" Pair. 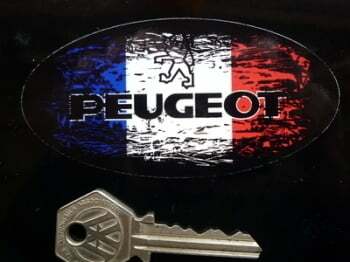 Peugeot Fade to Black French Oval Sticker. 4". 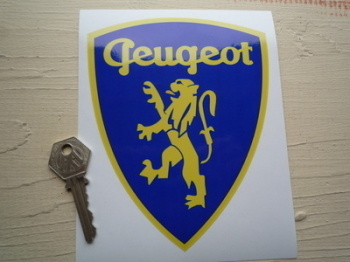 Peugeot Flag & Scroll Sticker. 4". Peugeot France Tricolore Style Stickers. 2" Pair. Peugeot Lions Head & White Text in Shield Sticker. 6.5". Peugeot Lions Head & White Text in Shield Stickers. 4" Pair. 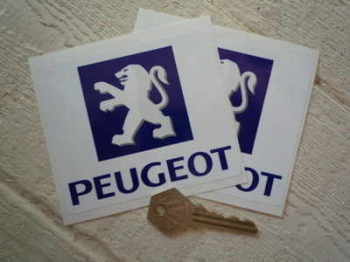 Peugeot Logo Square Stickers. 4" Pair. Peugeot Logo Wheel Centre Style Stickers. Set of 4. 50mm. 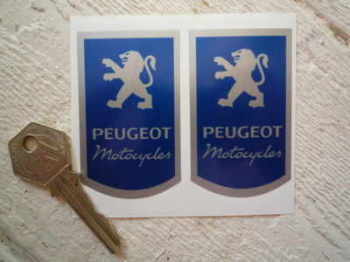 Peugeot Motorcycle Blue & Silver Stickers. 1.5" Pair. Peugeot Number Plate Dealer Logo Cover Stickers. 5.5" Pair. 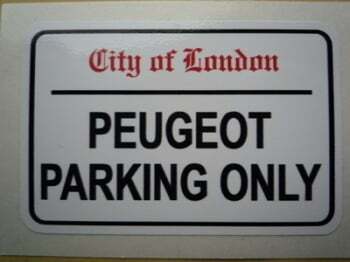 Peugeot Parking Only. London Street Sign Style Sticker. 3", 6" or 12". Peugeot Plain Style Black & Silver Wheel Centre Style Stickers. Set of 4. 28mm. Peugeot Script Text Laser Cut Self Adhesive Car Badge. 5.25". 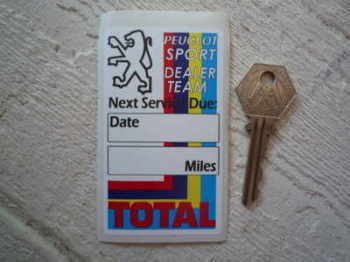 Peugeot Sport Dealer Team & Total Service Sticker. 3.5". 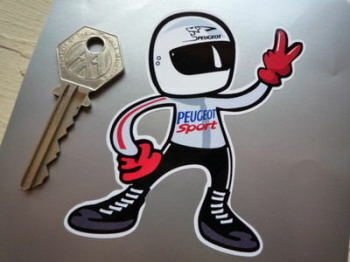 Peugeot Sport Driver 2 Fingered Salute Sticker. 3.5". 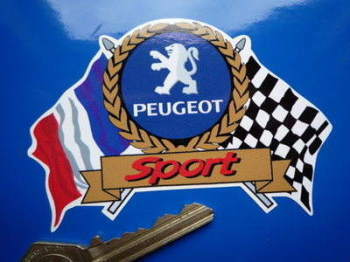 Peugeot Sport Flag & Scroll Sticker. 4". 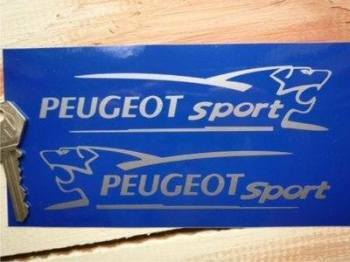 Peugeot Sport Kickplate Sill Protector Stickers. 20" Pair. 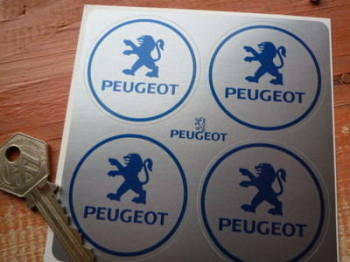 Peugeot Sport Lion Cut Vinyl Stickers. 6" Pair. 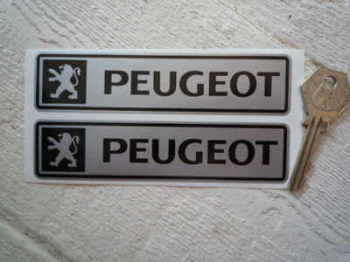 Peugeot Sport Lion Laser Cut Self Adhesive Car Badges. 5" Handed Pair. 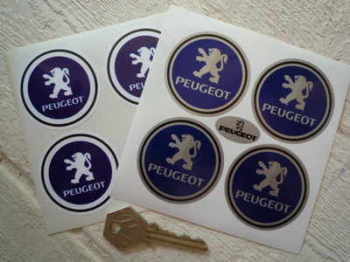 Peugeot Sport Logo Stickers. 10" Pair. 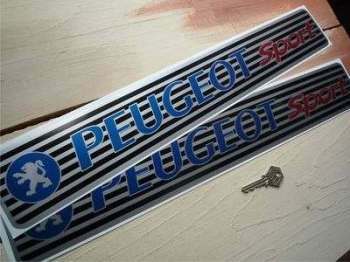 Peugeot Sport Number Plate Dealer Logo Cover Stickers. 5.5" Pair. 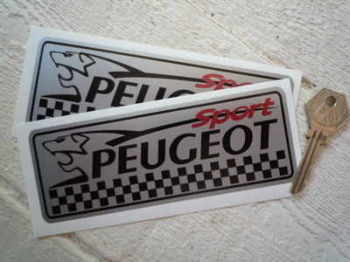 Peugeot Sport Silver Oblong Stickers. 6" Pair.